At the beginning of April, the company deployed its Blink Electric Vehicle Charging infrastructure in Antelope Valley Mall located in California. The Blink EV charging stations were provided and deployed in association with a Plug-in Electric Infrastructure grant provided by the Antelope Valley Air Quality Management District (AVAQMD). CCGI reported its first quarter 2015 financial performance which reflected significant improvement. Hardware sales grew 4.9 times from $37k to $221k for the three months ending March 31, 2015. EV charging fees climbed 52% from $255k to $389k. Grant/rebate revenue recognized grew 9.3x from $62,633 for the three months ended March 31, 2014 to $646,185 for the three months ended March 31, 2015. Annual charging output (energy) grew nearly 2.8x for the three months ended March 31, 2014 from 370,354 kilowatt-hours to 1.39M kilowatt-hours for the three months ended March 31, 2015. Car Charging Group, Inc. (OTCQB: CCGI) is a pioneer in nationwide public Electric Vehicle (EV) charging services, enabling drivers to easily recharge anytime, anywhere throughout North America. CCGI provides a turnkey electric vehicle charging service solution to commercial and residential property owners. Employing the most advanced technology, CCGI is committed to creating a robust, network for EV charging. With the increasing adopting over electric vehicles across the United States, CCGI is set up for potentially massive growth as the entire industry will lift all boats. CCGI will be able to capitalize significantly on this opportunity. Tesla will be coming out with a more affordable base model. As more EV come into the market, people will need a place to charge their vehicles. This is a market that has all of the right catalysts and CCGI could be at the center of it. Currently trading at a $28 million market valuation. This is an exciting story developing in small caps; CCGI holds the keys to an industry poised for massive growth. Short term CCGI could go much higher, long term it could drop once the excitement is over and if it isn’t able to turn a profit. 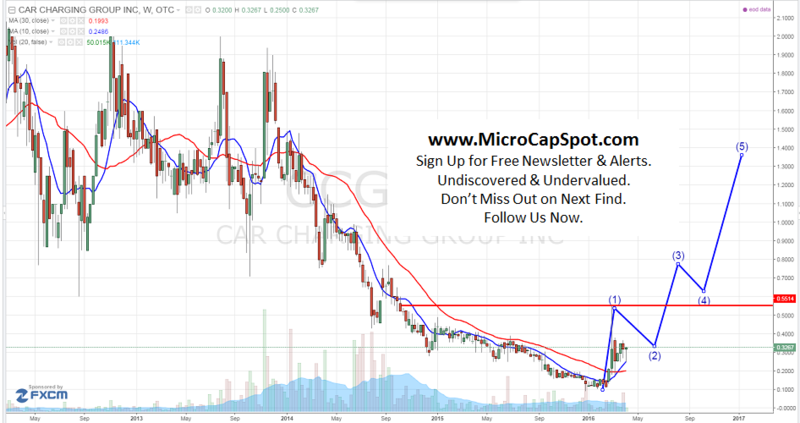 We will be updating on CCGI when more details emerge so make sure you are subscribed to Microcapspot so you know what’s going on with CCGI. Disclosure: we hold no position in CCGI either long or short at the publication of this article.